Ken Sharlin, M.D., M.P.H., IFMCP, is a board certified-neurologist, consultant, functional medicine practitioner, author and speaker. Dr. Sharlin completed his medical education at Emory University, Atlanta, GA (1992), and post-graduate training at Emory Affiliated Hospitals, The University of Virginia and Vanderbilt University. In addition to his M.D., he has a Masters in Public Health (Emory-1991). Dr. Sharlin has been in practice since 1998. Dr. Sharlin is one of the few medical doctors who is a functional medicine trained neurologist. Currently, he is the only physician to be recognized as a Wahls Protocol Certified Health Professional. He is also in the Bredesen MEND Protocol for Alzheimer’s disease prevention and reversal. 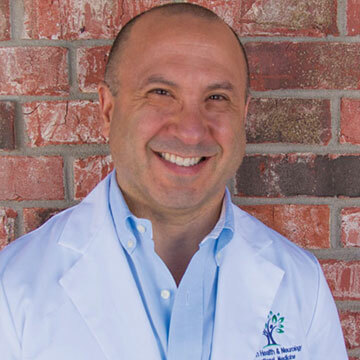 Dr. Sharlin practices general neurology, conducts clinical research, and directs his functional medicine program—Brain Tune Up!—through his clinic located in Ozark, MO. He is also the author of The Healthy Brain Tool: Neurologist-Proven Strategies to Prevent Memory Loss and Protect Your Aging Brain. Dr. Sharlin lives and works in Springfield, MO, is married and has three grown children. He became interested in Functional Medicine while exploring his own health and performance as a cyclist, runner and triathlete.